Mostly finished the giant, though I think I may go back and clean up that awful mold line I missed (and one other small one that's not visible) and then touch up the paint. She's a Reaper Bones figure, and the first I've worked on. The figures seem nice, but my two complaints are the mold lines -- which seem more numerous and prominent than on metal or traditional plastic figures -- and the bendy weapons. I did fix the latter, but somehow one end slowly bent itself back out of shape. I'm including three figures for scale comparison. I had initially thought the Reaper giants were a bit small. They are smaller than many of the competition. But after painting this one, I'm actually thinking I prefer their size & proportions to many of the others. I might have to pick up some others. 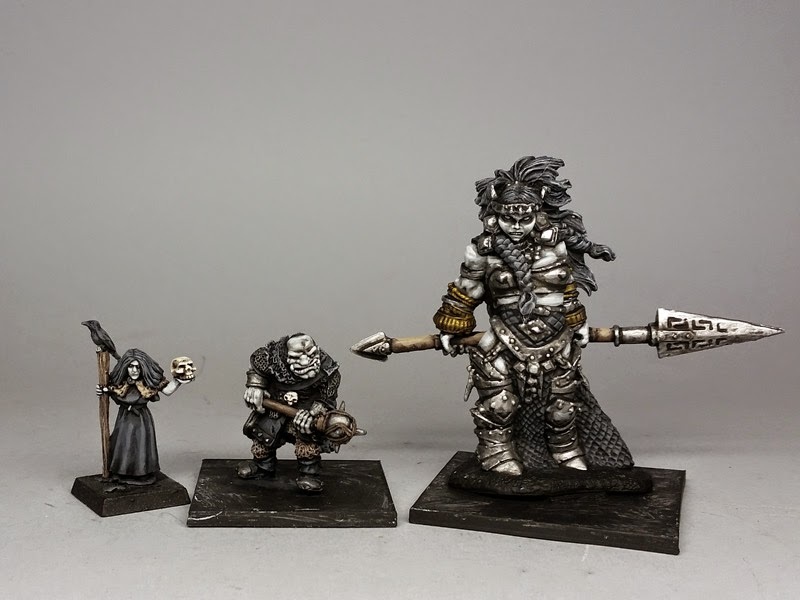 The sculpts look really good. Again... basing will be done in a big lot, after I've finished some more figures. Nice paintjob ! Love the undead look ! Did you use the boiling water and ice-water technique to bend the spear? If you didn't, it will bend back. I used this technique on my miniature and it is still like I fixed it. Great paint work on these. I agree, the giant has a nice size, and is far more suited for skirmish gaming than a GW one, which is really quite huge. I to have had Bones material slowly creep back to where it was pre-boiling, I think that the trick is to do it more than once, which is a paint when you want to get stuck in painting! Thanks for the comments. I did boil it, but rather than ice it, I left braced into the proper position for a day or two. One side stayed, but the other slowly creeped back. Not too bad, though. really changes the mood/atmosphere of the miniature. That's a great version of the giant. Thanks for sharing. Love the darker silver and the contrast of white skin.